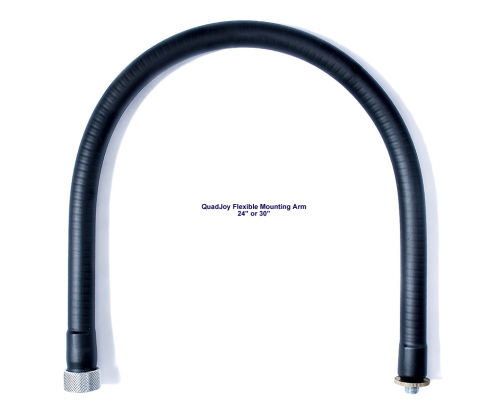 Option 12: QuadJoy Flexible Mounting Arm - 24"
Option 13: QuadJoy Flexible Mounting Arm - 30"
Canadian customers: Email us the Item and quantity of each ietm you wish to order. Verify each accessory with QuadJoy. 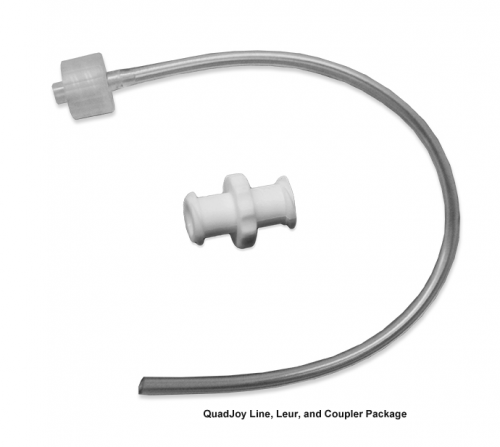 USA customers: Purchase directly from Quad-Joy. We do not ship this item to the USA. Special Order. Sale is final because of sanitory/health reasons. For sanitary reasons once it is shipped we can not take the product back. Sorry, no exceptions so ensure your order is correct. NEW replacement of our standard style stick for the QuadJoy with a male connection. Old style stick has a female connection. Chances are you don’t need this unless you talked with us and know you need it. This is the newest stick update built with a shorter, stronger, Polycarbonate mold. If your QuadJoy serial number is 2561 or lower, the adapter must be taken off the Magnet Holder to attach the new stick design. QuadJoy Line, Leur, and Coupler Package - Replacement parts for the QuadJoy. Includes 3 Line and Leurs and 2 Couplers. 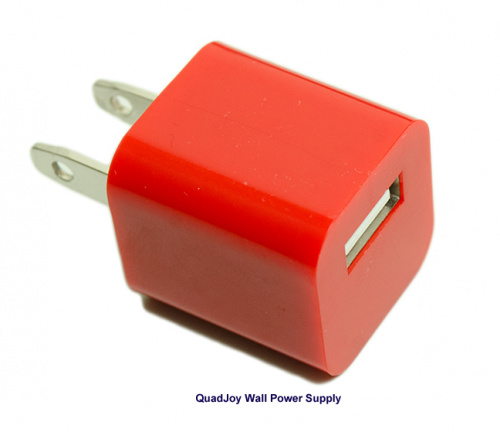 QuadJoy Wall Power Supply - The Wall power supply is used to power the Quadjoy when it is used in the Bluetooth mode. 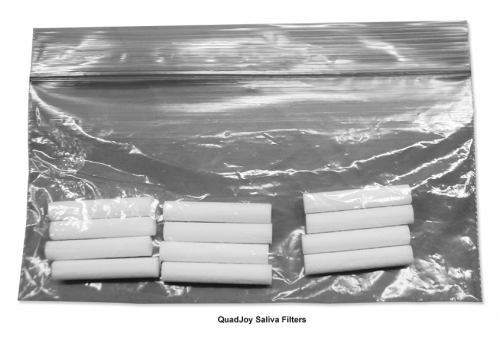 QuadJoy Saliva Filters - Replacement Saliva Filters for the Hygenic Stick. Includes one dozen filters. 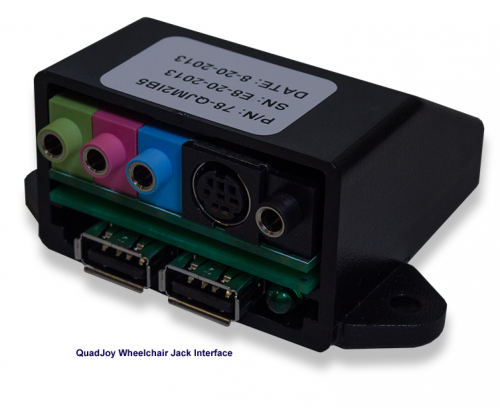 QuadJoy Wheelchair Jack Interface - The Wheelchair Jack Interface is intended to power the Quadjoy from the wheel chair battery. The interface also includes the 3 external jack inputs, the infrared universal remote control output, and dual USB type A connectors are for charging other mobile devices. The Wheelchair Jack Interface is designed to operate on 12 or 24 volts wheelchairs. A 48” battery connection cable and fuses are included with the unit. 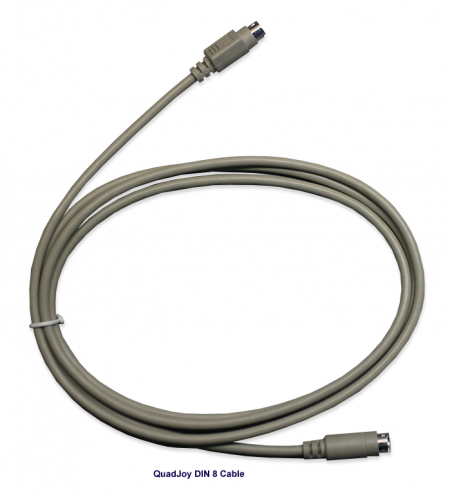 QuadJoy DIN 8 Cable - The DIN 8 Cable (6 feet) is for connecting the Quadjoy mouse to either the External Jack Interface or the Wheelchair Jack Interface. 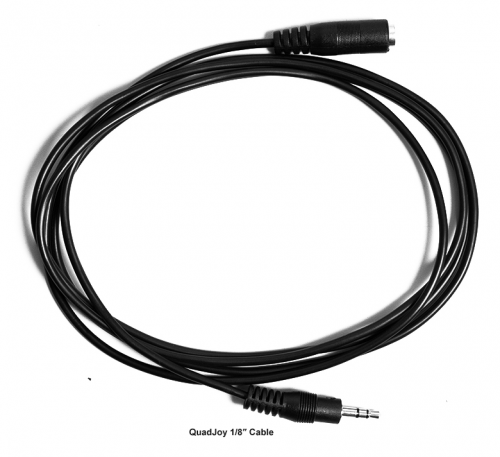 1/8″ Cable - The 1/8” extension cable is used to extend the Infrared Transmitter. 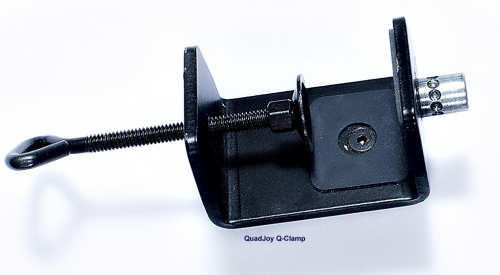 QuadJoy Q-Clamp - Replacement Q-Clamp for the QuadJoy. Attaches to Flexible Mounting Arm. Can be attached to a flat surface up to 1 7/8” thick at 5/8” inward from the edge. Dual mounting points to accommodate multiple mounting options. QuadJoy Flexible Mounting Arm - Replacement Flexible Mounting Arm for the QuadJoy. 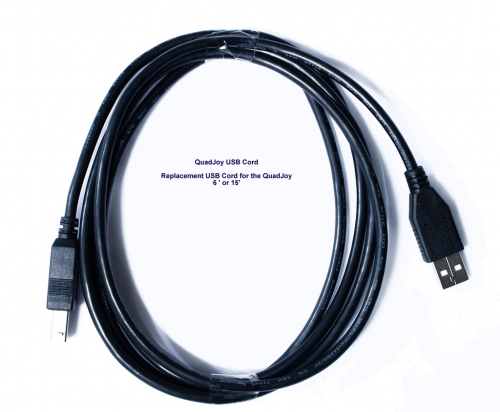 Attaches to the QuadJoy and the Q-Clamp - 24" or 30"
QuadJoy USB Cord (Male to Male) - USB Cord (Male to Male) 6 feet. 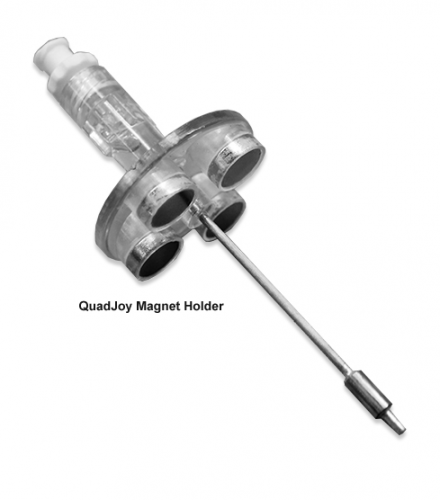 QuadJoy Magnet Holder - Replacement Magnet Holder for the QuadJoy. 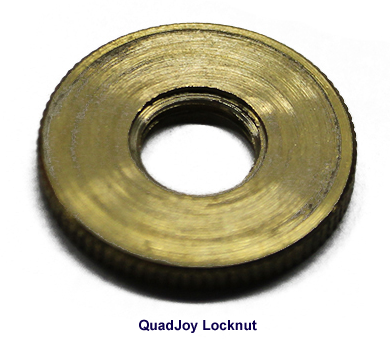 QuadJoy Locknut - Replacement Locknut for the Flexible Mounting Arm. 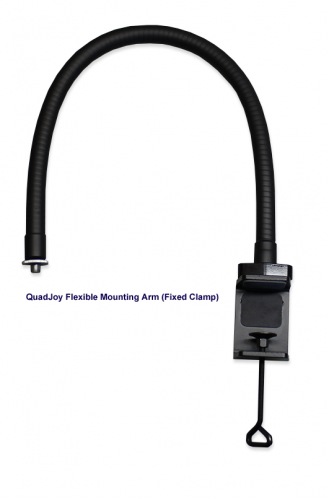 QuadJoy Flexible Mounting Arm (Fixed Clamp) - Replacement Flexible Mounting Arm for the QuadJoy. Attaches to the QuadJoy. The clamp is fixed to the arm. 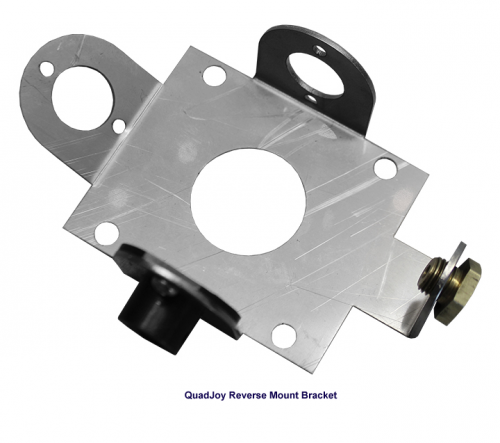 QuadJoy Reverse Mount Bracket - The Reverse Mount Bracket is used if the Quadjoy needs to be mounted from the Left, Top, or Bottom of the unit. 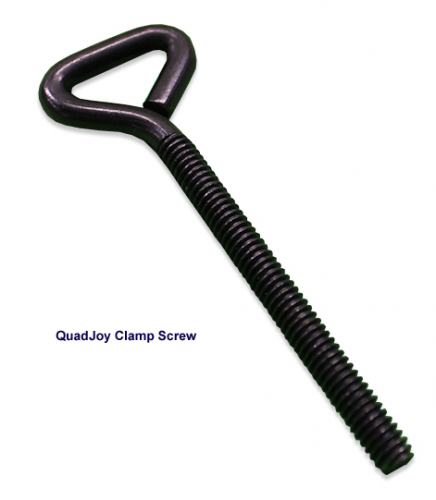 QuadJoy Clamp Screw - Replacement Screw for Q-Clamp. 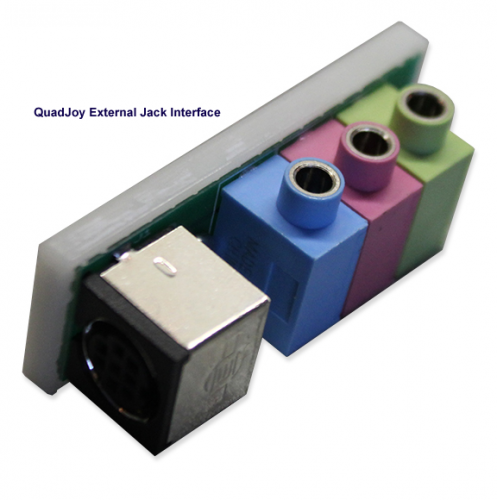 QuadJoy External Jack Interface - The External Jack Interface allows the connection of up to 3 external switches through 1/8” jacks. 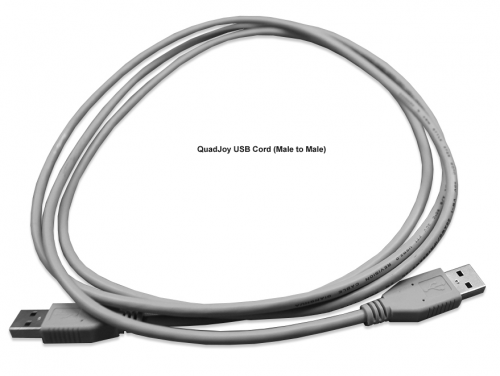 This interface is connected to the Quadjoy with the 8 pin DIN cable. 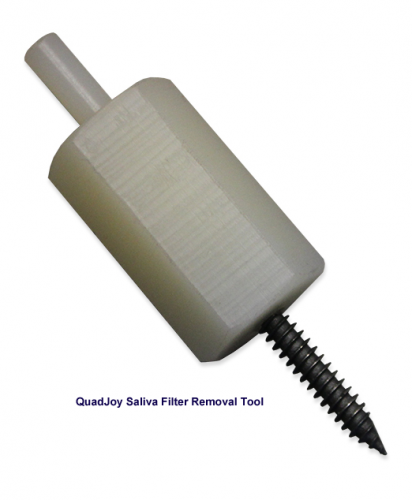 QuadJoy Saliva Filter Removal Tool - This tool removes the Saliva Filter from the Hygienic Stick. QuadJoy QS-Configure - The QS-Configure is a software program coming soon that will run on a Microsoft operating system. This program will allow a Quadjoy user to update their Quadjoy firmware, and install firmware options. Additionally, this software will allow the user to configure all the operating parameters of the Quadjoy that would ordinarily be set as factory defaults. QuadJoy QS-Remote - The QS-Remote is a software option coming soon to enable the Quadjoy to store and transmit infrared remote control signals. When available the “remote codes” will be downloaded from this web site and programmed into the Quadjoy using the QS-Configure software program. The user can then select the desired “remote code” and transmit it to control the device. The Wheelchair Jack Interface is necessary to allow this option to work. QuadJoy QS-Joystick - QS-Joystick is a software option coming soon to allow the Quadjoy to function as a Microsoft 16 button joystick. Additional features will include Z axis control, and X rotation. The 12 Puff & Sip functions can be programmed unique when in joystick mode. The QS-Joystick option can be downloaded to the Quadjoy after initial purchase with the aid of the QS-Configure software. QuadJoy QS-Drive - The QS-Drive is a conceptual software and hardware option to allow the Quadjoy to control external machines. Only the basic components of this option exist at this time. Users interested in controlling an external device are encouraged to contact Street Electric or Special Needs Computers to discuss future developments. QUADJoy Repair - Warranty repair or non-warranty repair - Please select the quantity of units you would like repaired. Repairs are typically processed within 48 hours. If we cannot repair your Quadjoy, we will replace it. Please note, the price of repair is an average. After we receive your unit, if the cost of repair is less than this price, a partial refund will be issued. If the cost of repair exceeds the average price, we will contact you prior to the repair. Please do not ship the arm, clamp, or accessories in your package. On the shipping label, please include the Quadjoy serial number found engraved on the back of your Quadjoy. We suggest insuring your Quadjoy during shipment. If you select “Warranty Repair” and your device is not covered under warranty, we cannot return your unit until we have received the correct payment.